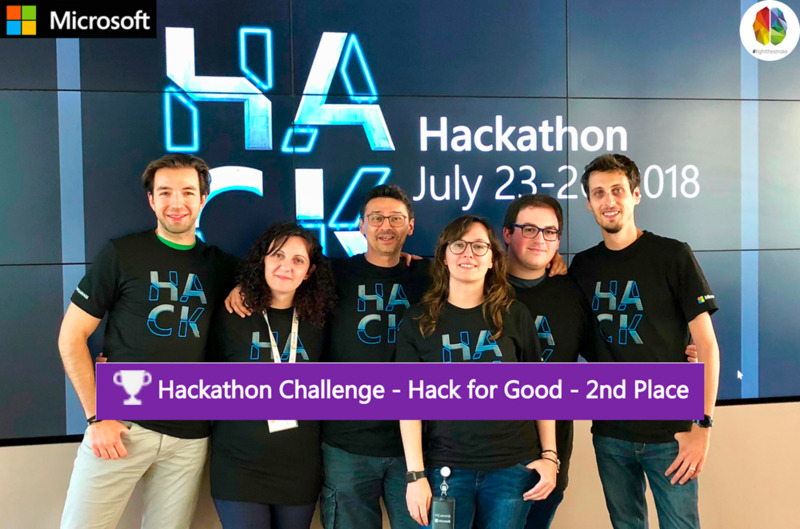 The Microsoft Team that participated in the Hackathon2018 (from the left): Alessandro Bigi, Veziona Ekonomi, Roberto D&apos;Angelo ( FightTheStroke Co-founder), Jessica Tibaldi, Daniele Antonio Maggio, Matteo Pagani. More, not pictured: Elena Terenzi and Ricardo Wagner. 2nd Worldwide Place on the "Hack for Good Executive Challenge"
Mirrorable It is a telerehabilitation platform that allows patients with motor difficulties to recover their skills in an ecological and entertaining way, thanks to the activation of Mirror Neurons . Developed by 2016 in collaboration with the CNR Neurosciences Group of the University of Parma and Prof. Giacomo Rizzolatti , the Platform Mirrorable It was validated in an experimental study that allowed to measure in a domestic environment the improvement of motor performance, empathy and compliance on 20 Italian children, from the Canton of Ticino to Sicily. Since then Mirrorable It has made its way and in order to allow a wider use, without geographic barriers, of language or skills, FightTheStroke He developed a new consumer version, accessible via browser and accessible from every home computer, in a prototypical phase: It was key to use artificial intelligence to classify hand movements and recognize them through a normal Webcam. With and for the latter project, and thanks to an expert team on Machine Learning within Microsoft, FightTheStroke He participated in the "Microsoft hackathon 2018" ranking in the second world place in the category "Hack for Good Executive Challenge". Thanks to the fantastic team that contributed to this new success, to improve the life and independence of the young survivors of the stroke: Alessandro Bigi, Daniele Antonio Maggio, Elena Terenzi, Jessica Tibaldi, Matteo Pagani, Roberto D&apos;Angelo and Ricardo Wagner.